David Jennings -- trumpet soloist, ceremonial trumpeter, pianist, professional musician, music instructor in the Detroit area. David Jennings Productions continues to sustain a level of performance that is second to none. 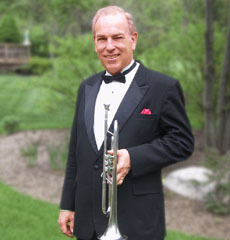 Whether you need solo trumpet, solo piano, trumpet and keyboard, or a brass ensemble, David Jennings Productions will provide artistic excellence tailored to your event's specific needs.